Svengoolie’s Top TV Godzilla Moments! 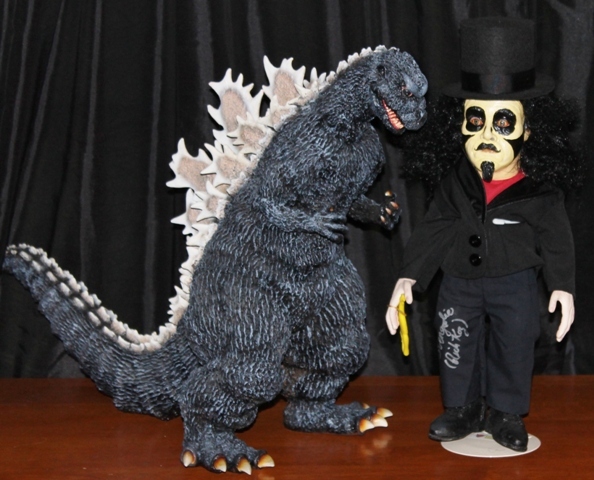 I was thrilled when I heard the news that Svengoolie will be appearing at this year’s G-FEST in Chicago! For those less savvy in the Godzilla world, “G-FEST” is short for Godzilla Festival and for fans of Godzilla, Gamera, Ultraman, or any other facet of Kaiju (Japanese giant monster) cinema, this is the event for which we revolve our calendar around. As a life long fan of Godzilla, I was happy when my 6 year old son, Alex, took to the Big G. We attended our first G-FEST in 2004 and I haven’t missed one since! I remember watching these films as a kid via Creature Features, Monstrous Movie, and Son of Svengoolie “back in the day” here in Chicago. As many of us American fans were ingratiated to these films by a Horror Host, it is very fitting that Svengoolie (and I’m hearing rumors of a few others) will be in attendance! Sven will be appearing on Saturday July 14th and greeting fans from 1-3pm. As Svengoolie has gone national and this event attracts a lot of folks from around the country, I am anxious to see some of his out-of-state fans get a chance to meet him! 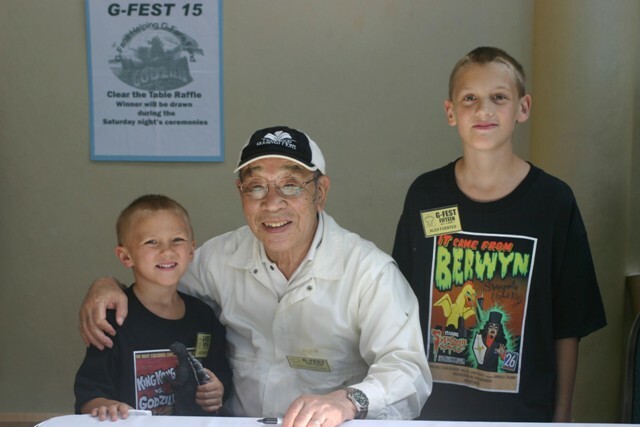 Alex in Sven shirt meets Godzilla himself, Harou Nakajima, at a past G-FEST! 2) GODZILLA EXERCISE TAPE/THERE’S NO ZILLA LIKE GODZILLA: That’s not to say that Sven didn’t occasionally get the rights to show a Godzilla film. As proven by these two bits aired during his presentations of GODZILLA 1985 and GODZILLA VS MEGALON! 5) THIS MOVIE ISN’T JAPANESE: Of course not every Godzilla film incites joy in kaij fans. 1998’s Tri-Star version of the movie is sure to evoke anger in many G-fans. This would lead to one of my All-Time FAVORITE Svengoolie parodies courtesy of a 1980’s hit..
6) THE MOTHRA SHOW: While airing MOTHRA, Svengoolie created this spoof of a certain iconic talk show host with side-splitting results! You can get your tickets for G-Fest by clicking HERE! Of course the Terror Daves will be sharing coverage and we’re looking forward to seeing you there! This entry was posted in Atomic Monsters!, Horror Hosts, Stalking Svengoolie! and tagged G-Fest, Gappa, Godzilla, Godzilla Vs. Megalon, Harou Nakajima, Japan, Monster from a Prehistoric Planet, Mothra, Rich Koz, Son of Godzilla, Svengoolie, Tri-Star Godzilla. Bookmark the permalink. ← “Abraham Lincoln Vampire Hunter”…The Book!